I know I usually do these things at a minimum on May 8th (and sometimes on 8/8, 11/8, and 2/8), but well something happened last week that I mentioned on facebook and twitter but not on the blog yet because I was too busy cleaning up the mess of it all. See, sometime Thursday morning, the compressor stopped running on our fridge. I remember thinking something sounded funny as I grabbed my breakfast, but I'm not exactly the most awake person in the morning, so I went about my day like I always do. Oh if only I had been paying attention. 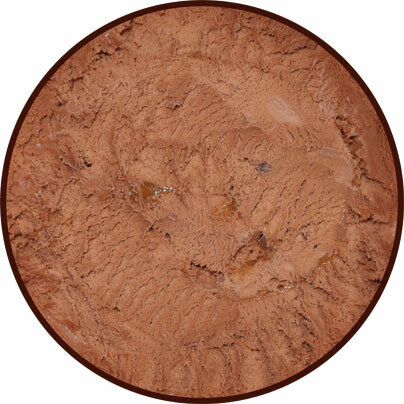 So it's Thursday night, I'm tired, and just want a few more bites of the slow churned version of Edy's German Chocolate Cake. I've already had a small first scooping, but I forgot to write down any notes, so I needed another taste to make sure I remember everything correctly. I go to grab the final serving from the container... and it's nothing but puddle. Ohhhhh man, what's going on? 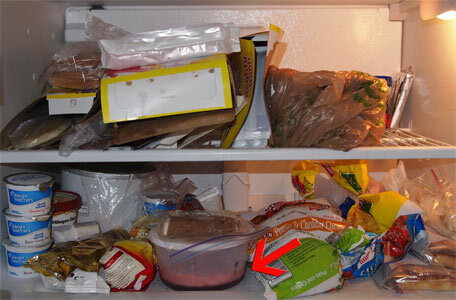 It's at this moment that I realize that all of the cardboard boxes in the freezer have collapsed... oh, and look at the sherbet (red arrow), it separated! Everything in the freezer is toast. The last of the weight watchers samples, the last magnum bars... oh, and a pint of haagen-dazs banana split that was still sporting last year's full time pint design (instead of the purple limited edition design). Yeah, the H-D was still sealed. Everything is floppy and damp and just a disaster in here. Everything here is a loss. And the fridge? Well, after watching a couple of internet videos, I learned how modern fridges work. They chill the freezer section and then circulate some of the cold air down in to the fridge which then pushes the warm air back in to the freezer for cooling. Ok, that's a simplified version of it, but you get the idea. The point is that the frozen products have been sacrificing their coldness to keep my fridge chilled all day. But what do I do now? It's 9:30 at night and I have no good way to tell if anything is still good. The next day, I had a few people at work ask me why I didn't throw some of fridge stuff in a cooler, but I have this as my answer: I've been sick in the stomach before and I'm not about to risk eating any of this. The penny pincher in me is tempted, but the voice in my head (which sounds strangely like my wife) is going "do you really want to get sick again?". No, no I do not. Uggg, all of my chilled sundae supplies are now toast too (remember, refrigerate after opening!). So much for having a mixed berry sundae sunday (though you can see one sundae here that uses the hershey's mixed berry sundae syrup). 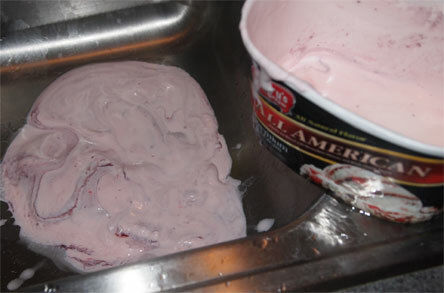 To be honest, I've already walked by a new container of it a few times at Walmart and have no urge to replace it. The syrup tasted as expected, but it didnt really wow me at all (and it's not as photogenic as say a strawberry sauce). 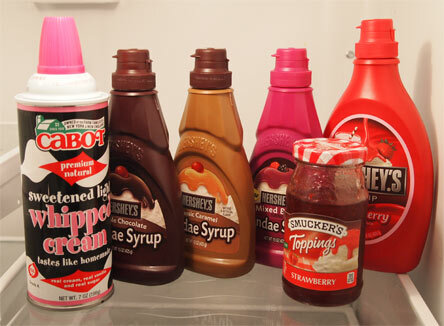 The good news is that I've picked up those new Smucker's topping plus the Hershey's York sundae syrup, so look forward to me using those in the near future. Ok, so that's i for now, I just wanted to get everyone caught up. Next week is going to be Nick week, he's going to throw 7 back to back reviews at us so I hope you're ready.... actually, I hope I'm ready, I better go get photoshop warmed up. I've gone through the broken freezer thing twice in the past year and it's very frustrating! I also absolutely hated having to throw out my ice cream stash but would rather lose the money than be sick! I'm totally with you on that one! Enjoy the new freezer; hope you get it well stocked with new treats soon! Did you call your insurance company? This happened to me and they replaced my food. It was probably only $150 so I didnt think it would count. I guess it wouldn't hurt to ask!